The Green Party is gaining momentum across the province. 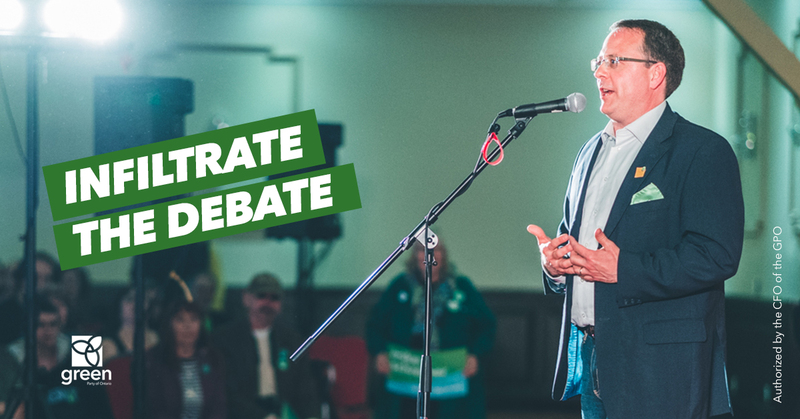 Leader Mike Schreiner has crossed the province meeting with enthusiastic people who want integrity, intelligence and honesty in their choice and Schreiner delivers. In fact, Mainstreet polls predicted Schreiner would win his seat in Guelph. Across the region our candidates and their teams are out everyday talking with potential voters. Looking at lawn signs reveals that people are tired of the status quo and find the Green platform refreshing and clear in objectives. 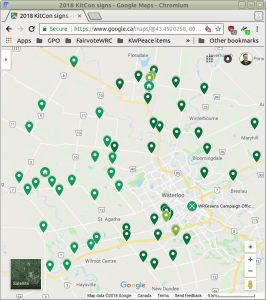 Today, the Green Party candidates for Waterloo Region Green Party have released a made-in-Waterloo Region platform to let the people in this region know that their Green candidates will be strong advocates for the needs of this community. Because they understand the value of collaboration and cooperation, the candidates created the document as a team. Stacey Danckert, Zdravko Gunjevic, David Weber, Bob Jonkman, and Michele Braniff at 226–476&dash;4529, 6 Duke St E., Kitchener, Ontario Map. I had the privilege of attending an information session on 16 May 2018 by ReVision ADP hosted by the CNIB about the Ontario Assistive Devices Program which provides magnifiers, text-to-speech devices, braille output devices and other technology to help people with low or no vision. I learned that the existing ADP formulary is outdated — a participant can acquire a device only once every five years, and because technology advances at a much faster pace, participants often only have access to obsolete equipment. Participants cannot acquire the devices of their choice, only those prescribed by the (out-of-date) formulary. Even worse, repairs for old broken or worn-out devices are not covered under ADP, and must be paid out of pocket. Finally, there is a restriction on vendors — participants can acquire devices only from “authorized” distributors, which causes higher prices than necessary, and since there is vendor lock-in, poor customer service because there is no competition. Candidates were asked to pledge to meet with ADP participants within the first 100 days of government to discuss updates to the formulary. I am happy to make that pledge myself, and I’ve asked the Green Party of Ontario to provide an answer as well. An addition to the formulary for navigational aids, such as GPS units. Smart phones may have that technology built in, but their battery life is too short. A request to remove the restriction on “authorized” distributors. This will lower costs, make a wider range of devices available, and improve customer service. The ADP is very prescriptive, the users of assistive devices have little input. There should be more self-determination of needs by participants, and participants should be able to make meaningful feedback to ADP administrators. 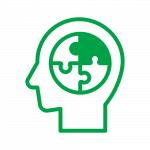 There is a lack of customization in the ADP formulary. I’ve seen this bureaucratic rigidity in other areas — there appears to be a lack of compassion from those who apply the rules. There are silos of responsibility, and little coordination between those silos that would result in better service. Apple is a leader in accessibility support, but other vendors and local tech businesses have a long way to go. Still, there are shortcomings in Apple’s offerings; for example there is a lot of ambient noise in their stores, making it difficult to read with text-to-speech devices, or make use of speech technology such as Siri. I worry about the dependency on commercial vendors for accessible devices. A for-profit vendor will provide features such as accessibility only as long as it is profitable for them. Perhaps there needs to be legislation that requires accessibility features to be a standard part of all modern devices. This will make a wider range of assistive devices available, will probably lower the cost of accessibility, and removes the threat of devices being removed from the marketplace because of their niche usage. There are no funds for upgrades to technology. As a computer consultant, I recognize that the usable lifespan of mobile devices is maybe two years. After two years new technology has eclipsed the old technology, making it cost-effective to upgrade. Also, consumables (batteries, software) become scarce after two years. The ADP formulary needs to keep pace with technological progress. Descriptive video needs to become a standard in the AODA (Accessibility for Ontarians with Disabilites Act). Devices purchased under ADP (and their supplies and repairs) should be exempt from sales tax. Recreational devices need to be covered in the ADP formulary (eg. fitness watches, pedometers). Sadly, many of these commercial devices are not accessible. Participants acquiring new devices need to be provided with hands-on training, in the home. A classroom or store setting isn’t going match real-use requirements. The ADP lifespan for products is not long enough. For example, glasses prescriptions may change rapidly over course of a year, so a five year term for ADP is inadequate. In fact, glasses are covered under ADP only for specific prescriptions; needs to be broadened. There is a $75 cost to re-apply for ADP — need to remove that! This appears to be one of those bureaucratic lack-of-compassion issues. The Green Party of Ontario is committed to doing Health Care right. Providing a Guaranteed Liveable Income (or Basic Income Guarantee) will go a long way towards providing independence to people currently dependent on government programs. A preventative health care system will reduce the costs of providing “sick care”. A comprehensive pharmacare program for all ages should include assistive devices. And there needs to be no-cost coverage for “health care above the neck”: dental, hearing, and eye care, and full mental health care coverage under OHIP. Hi Bob, I am just wondering what your views are on the social housing crisis for newcomers to Canada in the Kitchener area? Hope you can answer before voting day. Hi! There is a social housing crisis not just for newcomers to Canada, but for anyone of low income, affected by disability, or in a social situation that removes them from access to housing. The situation for refugees has responsibility divided among all three levels of government — the Ministry for Immigration, Refugees and Citizenship at the federal level, the Ontario Ministry of Housing and Ministry of Municipal Affairs, and finally the municipalities who are tasked with setting the by-laws and issuing the building permits for housing. 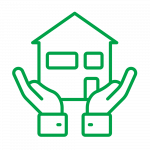 The Green Party has been advocating for a comprehensive Housing Strategy at both the federal and provicial levels. 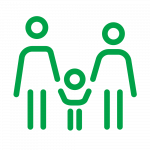 The Green Party of Ontario’s platform on housing is to ensure that 20% of all new development is affordable housing. But rather than burdening municipalities with the costs, funding for shelters, social, co-op and supportive housing will come from the developers, and an increase in the housing speculation tax. In addition, we would relax municipal by-laws (through the Ontario Municipal Act) to permit “tiny homes”, laneway homes, and basement apartments, which will increase the supply of housing almost immediately. Please have a look at the Green Party of Ontario’s platform, and let me know if you have any other questions! Voting Day is Thursday, 7 June 2018, but if you’re busy or out-of-town you can vote now at one of the advance polls. Here are the locations as listed on the Elections Ontario website. Who wants a lawn sign? The Kitchener–Conestoga Sign Team has been busy: The road signs are mostly up! We’ll deliver it to you in a day or two, and pick it up after the election. 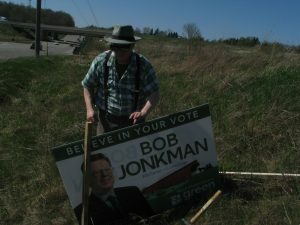 Posted in Bob Jonkman	| Tagged lawn signs, sign	| Comments Off on Who wants a lawn sign? Updated 4 June 2018, including some corrections from InterCityRail technical experts — Thank you! Kitchener–Conestoga rural residents are worried about the High Speed right-of-way cutting their farms in two, and since HSR cannot have at-grade crossings (because HSR is 200+ 177+ km/h speeds), farmers are concerned that they’ll have to detour tens of kilometres out of their way to access their farmlands — InterCityRail says only four grade-separated crossings are planned required to be kept open between Kitchener and London. It is not known how many will eventually be kept open. There would be only seven stops: Starting in Windsor, through Chatham, London, Kitchener, Guelph, Malton, and ending at Union Station in Toronto. None of the smaller communities such as St. Mary’s or Stratford would have service. Not even the large community of Brampton is slated for a High Speed Rail station. If the experience of expanding GO Train service around 2012 is anything to go by, VIA Rail will cut its service to those communities once High Speed Rail is established. 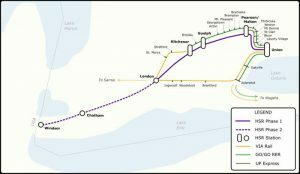 Phase One would connect Toronto with Kitchener-Waterloo and London with operations starting 2025, while Phase Two would extend the route to Windsor Ref1. Phase Two is not of immediate concern. An alternative, High Performance Rail (HPR) has been proposed that would allow slightly slower trains (150-180 175 km/h) to run on the existing right-of-way and still have grade-level crossings, but the Minister of Transporation, Kathryn McGarry (Lib), has flat-out said the government will not consider anything in their EPA study except a new High Speed Rail corridor. And the Ontario Federation of Agriculture that represents the farmers directly affected by this have not been consulted, and do not have a voice in the decision making. Last week I was invited to participate in THEMUSEUM‘s Cultural Exchange 6.0 — Every election THEMUSEUM brings together candidates and people from Waterloo Region’s culture and arts community to discuss the importance of arts and culture. The candidates move from table to table for discussion, punctuated by each candidate speaking to everyone about their party’s platform. I spoke of learning music for mental health, and the importance of music, art and culture in all sectors of society. WRGreens Campaign Office Opening Party! The office isn’t quite ready yet, but the WRGreens are holding a party anyway! Please join me, the candidates from the other Waterloo Region ridings, the volunteer office staff, supporters, friends and family as we celebrate the opening of our campaign office. What: WRGreens Campaign Office Opening Party! There will be pizza and snacks; if you can, bring something to share! 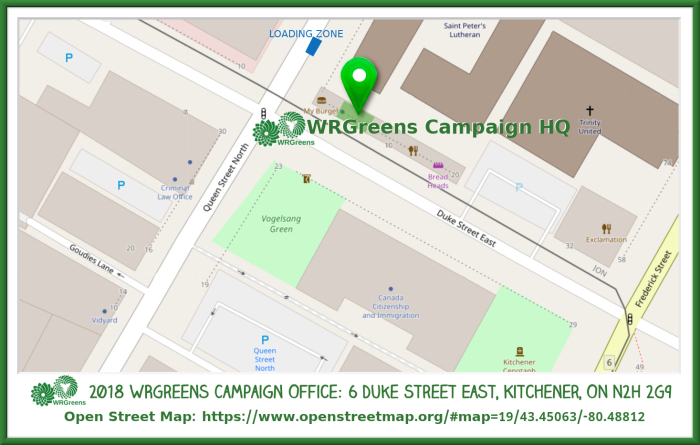 Posted in Event	| Tagged Campaign Office, WRGreens	| Comments Off on WRGreens Campaign Office Opening Party!